Will Gutenberg Hurt SEO for Education Marketers? Last week we talked about the big news around WordPress’s 5.0 and the new Gutenberg editor. So how is this going to help or hurt your SEO efforts? One of the first concerns education marketers will have over the changes coming in WordPress 5.0 and the new Gutenberg editors is whether it will help or hinder their SEO efforts. One of the many reasons for using a content marketing strategy is that Google, the most popular search engine by far, prefers to send search users to sites that use this kind of marketing strategy. Since you put so much time into crafting your content, it’s natural that you’d put the time and resources into SEO so that Google can easily find you and recommend your website to users. Gutenberg’s going to make content creation simpler for education marketers — great! But if it makes it difficult for search engines to find you, none of that matters, which is why we’re going to dive into this issue right here. My team and I have been using the Gutenberg beta plugin for several weeks now. The SEO capabilities we’re going to talk about here are still in development, but they should be ready for you when WordPress 5.0 comes out later. Here’s what we’re finding out when it comes to optimizing your content for search engines. What will SEO look like in Gutenberg? In the classic WordPress editor, you would optimize pages for search engines by filling out the metadata of the page with the correct information. This is an overly simplistic summation of SEO, but the main idea is that you would think of SEO in terms of helping Google find and recommend your page or post to search users. But in Gutenberg, you should be able to optimize the metadata of each content block you place in your content, according to Yoast. To get an idea of what blocks look like, here’s what a new post with some content blocks looks like in Gutenberg. You can see in the right sidebar all of the normal metadata you would optimize for search engines. This metadata pertains to the entire page that we’re looking at. Yoast is saying not only will we have the ability to optimize content for search engines by the page, but we should also be able to change the metadata of each content block. That means not only can you offer Google your page or post as an answer to the question asked by the search user, you can also offer Google individual content blocks as possible answers. For an example of how this would work, think of my last post where we did a little walkthrough of the new Gutenberg editor. If someone were to enter a question into a search engine like “What is Gutenberg,” then one of the content blocks in my “What is Gutenberg?” section could be found by Google as a quick answer to their question. This would work like Google’s “Featured Snippet” and answer summaries currently work. In the Featured Snippet and answer summary, Google gives the user a quick answer and the link to the full article. At the moment, no one knows how Google finds and summarizes answer summaries, so there’s no way to optimize your site for this. But what if you could make your content blocks prime candidates for an answer summary? Then, if someone searches for “what’s FAFSA” or “How do I apply for college,” you could improve your odds of being in the Feature Snippet or answer summary. And if that’s not such a big deal to you now, imagine what block metadata will mean as voice searches become more common? 3. 13% of all households in the United States owned a smart speaker in 2017… That number is predicted to rise to 55% by 2022. Voice recognition software is getting amazingly accurate and more helpful everyday. People are trusting and using voice search software like Apple’s Siri, Google’s Assistant, Windows’ Cortana, and Amazon’s Alexa more now on their mobile and home devices. But the day is coming when people will search for answers to questions using everyday things like refrigerators, speakers, and cars that are connected to these voice search providers. Imagine a mother and daughter driving to the mall as they talk about the daughter’s school work. The conversation slips into what she wants to do for college. But she doesn’t know what kind of academic programs she needs to become an equine veterinarian. Mom doesn’t know either. Google then pulls a content block written in an article by a private college from its equestrian program and reads it out loud to the mother and daughter while they’re still driving in the car. Google isn’t going to read an entire article. This means that content blocks — short snippets of information — could become an invaluable tool for education marketers. From what we can see from here, Gutenberg’s metadata blocks will enhance education marketer’s ability to get their content in front of the right audience at the right time — no matter where their audience happens to be. There is still a lot to learn about Gutenberg, but early indications suggest this is a huge advantage and step forward for private independent schools, colleges, and universities. So, even if the change looks scary at first, Gutenberg should bring a lot of key benefits that you won’t want to miss out on. Have a friend who needs to know about this? 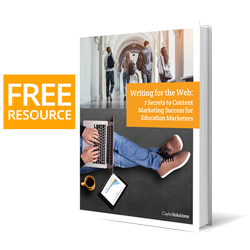 If you know of someone in education marketing or leadership that needs to know about the latest tips, strategies, and technologies in education marketing, send this article to them and ask them to subscribe. We’re not marketing generalists. At Caylor Solutions, we strengthen enrollment pipelines through education marketing solutions every day. This has been our passion for over 30 years — and we’re happy to share what we’re still learning with you in every blog post. And if you need us, you know where to find us.